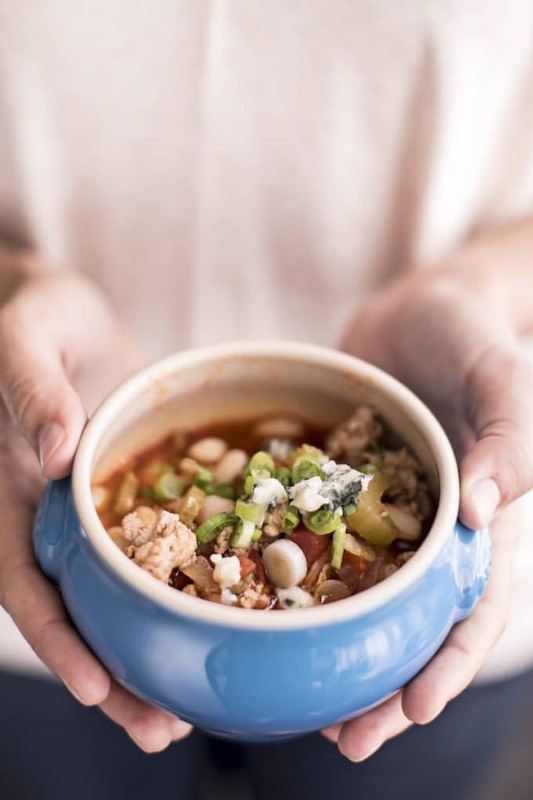 This gameday buffalo chicken chili is the perfect gluten-free recipe for tailgating, watching the game or just curling up this Fall. 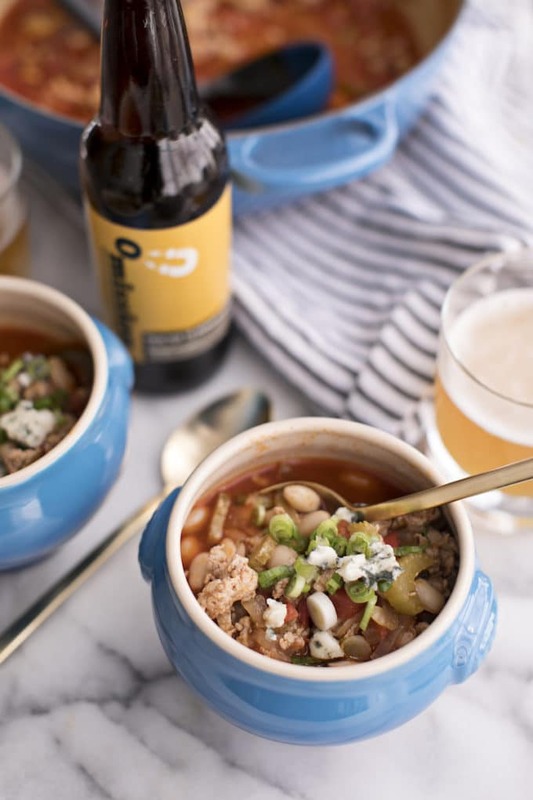 Made with gluten-free beer, pastured ground chicken, cannellini beans and an all-natural buffalo sauce, this chili is healthy, full of protein and delicious! 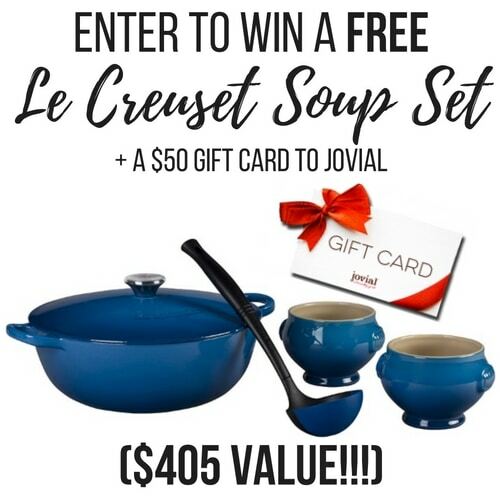 GIVEAWAY ALERT: SCROLL DOWN TO THE END TO ENTER TO WIN A LE CREUSET SOUP SET + A GIFT CARD TO JOVIAL FOODS VALUED AT $405!!! It seems like everywhere I turn lately, everyone is ridiculously, over-the-moon, can’t-control-their-excitement, full-on-bonkers thrilled that Fall is here. I can’t disagree–the cool weather, the changing leaves, the scarves and boots and sweaters, and most importantly, the eats! 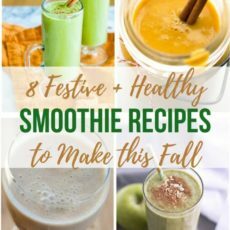 I just love cooking during Fall–everything is hearty and cozy and full of flavor and just makes me want to curl up on the couch and binge watch something amazing on Netflix (which, by the way, we just finished season 2 of Narcos and WHOA! It was so awesome!!). PLUS, Fall eats are usually centered around football, and as a Georgia Bulldawg, I can’t get enough of tailgating and gameday eats. Of course, ever since I started following the anti-inflammatory diet, tailgating has become a bit of a hit-or-miss event for me. Most dips have dairy, so many dishes are full of gluten, and the junky, inflammatory oils abound in pretty much everything on the table. Don’t even get me started on the amount of processed food found at most tailgates. 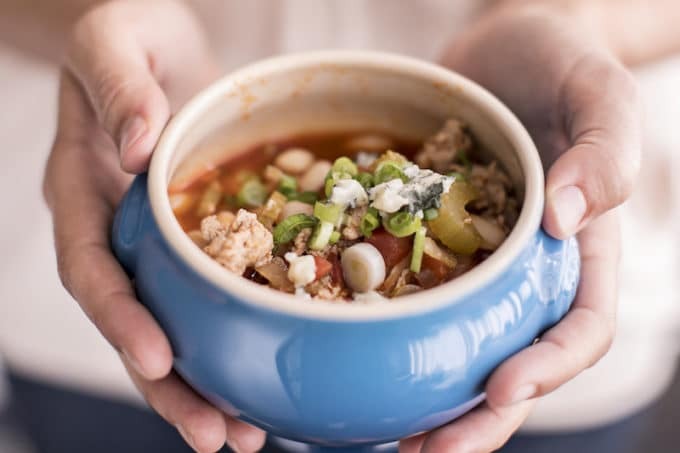 So I’ve taken to coming up with a few of my own tailgating dishes that fit in with my healthy lifestyle, without sacrificing any of that classic gameday flavor. If you’ve been following Root + Revel for a while, you know that flavor is paramount over here. If you’re new here, let me give you the quick rundown: before I started R+R, I was (and still am) a food and travel writer for magazines and newspapers, whose job it is to report on the most delicious foods in the world. So when I was diagnosed with PCOS, Leaky Gut and Insulin Resistance, I had a minor panic attack wondering not only how I could survive happily without delicious food, but also how I could still do my job. I knew I could never be one of those people to just bake a boneless, skinless chicken breast and steam some broccoli and call it a day. Turns out, there was no need to freak out. 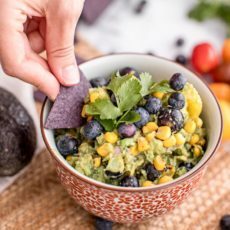 I’ve found that eating real, whole foods not only helped me reverse all of those chronic conditions naturally (learn more about how I did that here), but is also incredibly delicious and flavorful! And there are dozens of brands out there making dairy-free, gluten-free, healthy eating possible. Take Tessemae’s for example. This amazing line of dressings and condiments swaps inflammatory oils (that would be canola, soybean, vegetable, cottonseed, etc.) for good-for-you ingredients, namely olive oil, and has many vegan, Whole30 approved products made without any harmful chemicals or additives. In the past, if I were making a buffalo sauce dish, I would’ve used Frank’s Buffalo sauce. But then I read the ingredients label: Canola Oil, Xanthan Gum, Sodium Benzoate, Natural Butter Type Flavor. I’m sorry, whatever happened to good ole’ chiles and vinegar for hot sauce? I was so glad to find Tessemae’s All Natural Buffalo Sauce, which uses olive oil and real food only. Plus it tastes amazing! Especially because, what would gameday be without buffalo sauce? I also used their buffalo sauce in my gluten-free buffalo chicken meatballs, which are another gameday favorite. What about finding the best quality meats? Another brand making healthy, delicious eating possible on gameday, and all other days of the year? Jovial Foods. 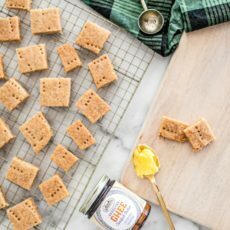 The husband and wife team behind this healthy brand realized they needed to go beyond organic to treat their daughter’s sensitivity to modern, processed wheat. 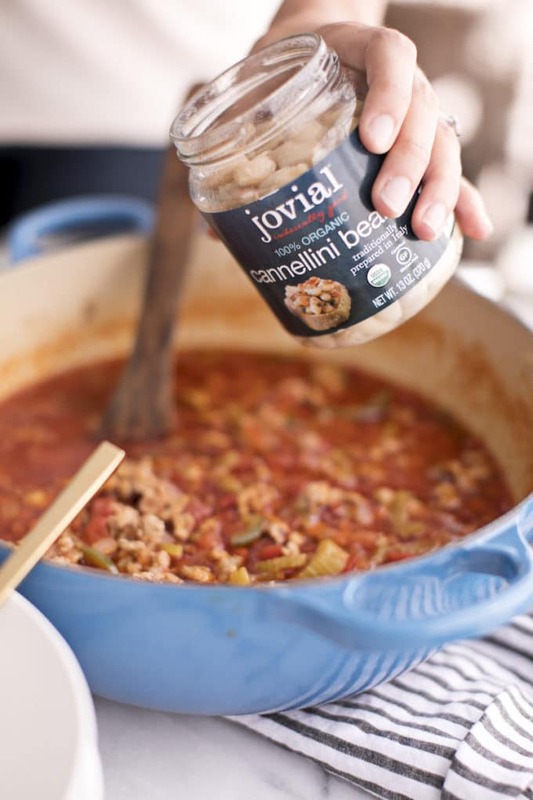 So they started Jovial, which is a line of gluten-free (and allergen-free) products built around high-quality organic ingredients. They also rely on an ancient grain called einkorn, and, perhaps my favorite feature of their brand, they package most of their goods in BPA-free glass bottles. They’re gorgeous, and worry-free since glass doesn’t contain many of the toxic chemicals plastic and canned goods often do. Keep reading to enter to the win our giveaway below, which includes a $50 gift card to Jovial Foods! 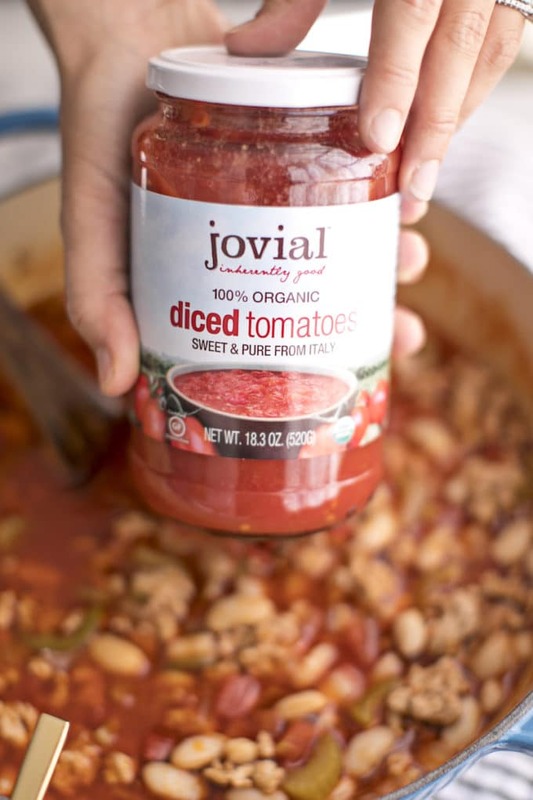 I love that this chili is full of good-for-you ingredients, like these organic cannellini beans and diced tomatoes from Jovial (did you know that most canned diced tomatoes contain added sugar, excess sodium and other harmful additives)? That’s why it is SO IMPORTANT to read your labels! 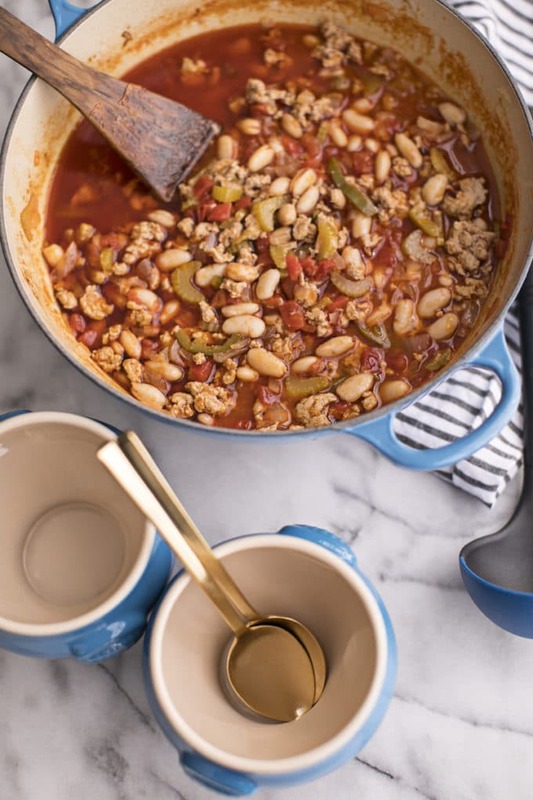 The beans add tons of protein to this chili, which is also made with ground chicken. Look for organic, pasture-raised chicken to support sustainable, humanely-raised farmers! What would a buffalo chicken meal be without beer? Since going primarily gluten-free (I still eat gluten occasionally since I’m not technically intolerant), I’ve tried to cut down on the amount of beer I drink–which is particularly tough during football season. But then I found Omission beers. I admit, I was wary at first and wrongly assumed that any beer without gluten would be pretty gross. Turns out, it’s pretty dang delicious (I honestly don’t think I could tell the difference in a blind taste test! ), and so much better for you. Since Omission beers are brewed just like other great craft beers–with malted barley, hops, water, and yeast–the taste is almost identical. But once the beers are ready for fermentation, Omission adds a brewing enzyme called Brewers Clarex, which breaks apart the gluten protein chains, resulting in a beer that has been crafted to remove gluten (which is different from other beers that are made with gluten-free grains, like sorghum). Rest assured, it is free of gluten–the founder is Celiac and he drinks these beers, if that gives you any indication. 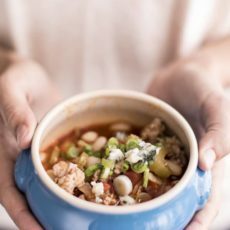 I throw a whole bottle of their lager into this buffalo chicken chili…and I may also serve the chili with an icy cold glass on the side. Try their pale ale, too. I love it! I’d be remiss if I didn’t give a shoutout to Le Creuset here, as well. These adorable individual chili bowls (or soup crocks) are part of their Marseille Soup Set, which I’ve been using on a near daily basis for the past month. 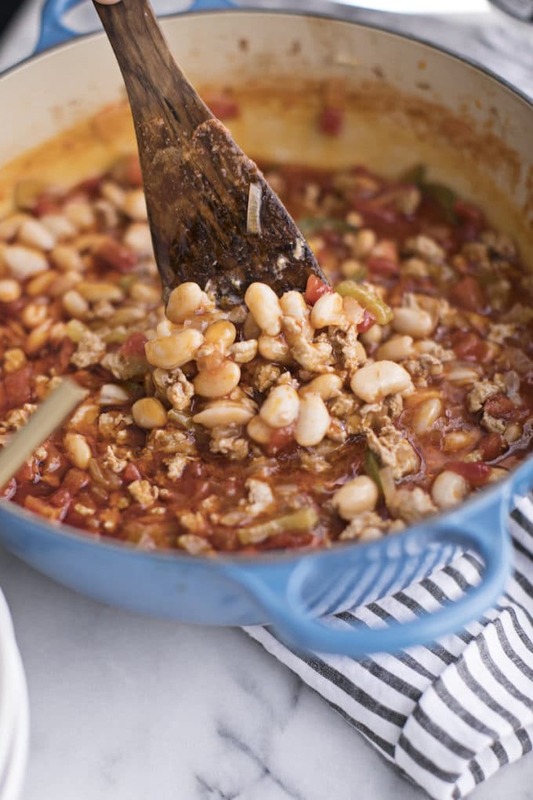 Soups, stews, chilis, sauces…you name it, and I’m probably making it in my Le Creuset. It’s not only gorgeous–this vibrant blue color brightens up every meal!–but it’s super lightweight and easy to handle, which Matt was all-too-excited to point out. As our resident dishwasher, Matt was thrilled at how light this dutch oven was, especially compared to another brand I’ve used in the past, which apparently was much heavier and more difficult to clean. So props to Le Creuset–they’ve hit the jackpot with their products, which have been the gold standard in cookware for decades, and I love that their dutch ovens are made from cast iron, stoneware and silicone, meaning they’re safe and non-toxic to cook with (unlike many non-stick pans). Marseille Soup Set by Le Creuset (includes a 4.25-quart Soup Pot, Revolution ladle, and two Heritage soup bowls), a $355 value! You can see the soup set in action in the photos for this recipe. Plus, sweeten the pot (pun intended!) with a $50 gift card to Jovial Foods, one of the country’s leading Organic, Gluten- and Allergen-Free brands. 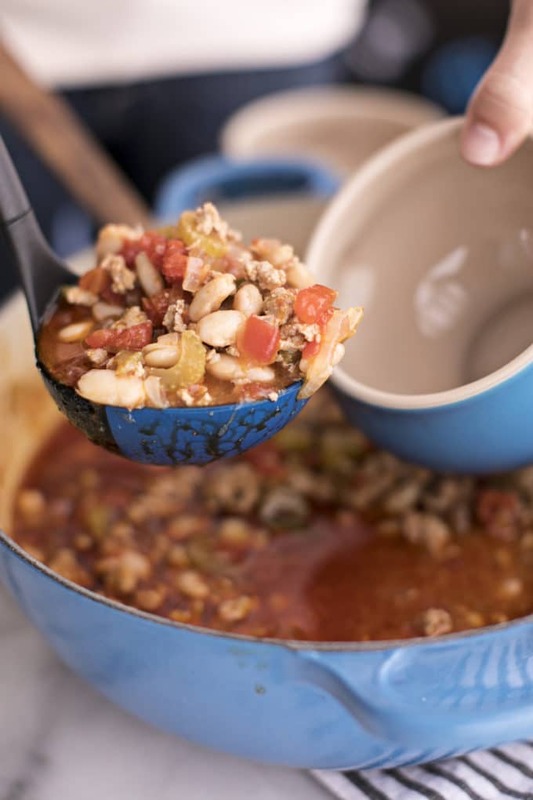 I used their cannellini beans and diced tomatoes in this recipe for buffalo chicken chili. In a large dutch oven over medium-high heat, melt the ghee. Add the onion, celery, and jalapeno and saute until soft, about 5 minutes. Add the garlic and saute until aromatic, about 1 minutes. Add the ground chicken and brown, breaking up with a wooden spoon, until cooked through, about 5 minutes. 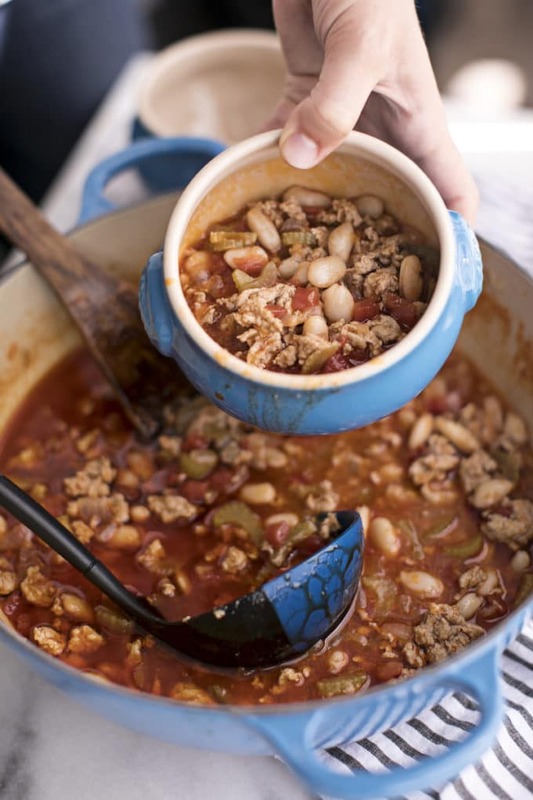 Pour the gluten-free beer into the dutch oven, scraping up any browned bits from the bottom and sides. Add the diced tomatoes and buffalo sauce, reduce heat the low, cover and simmer for 15-20 minutes to let all the flavors infuse. Add the cannellini beans and simmer for another 5 minutes. Garnish with chopped scallions and crumbled blue cheese, serve and enjoy! **Note: The nutrition facts do not include the buffalo sauce, as the generator did not recognize this ingredient. Always in need of healthy tailgate ideas. Definitely making this for the Pats game!